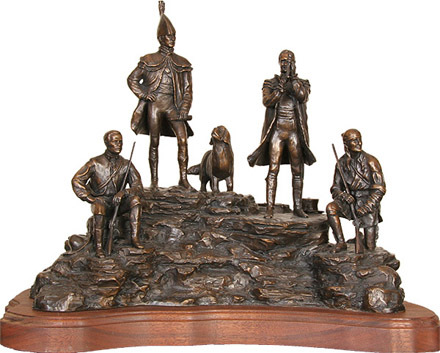 The limited edition maquette of "Corps of Discovery Monument" is now available. Price valid through July 1, 2008. Unveiling of the heroic-size bronze figures was June 4, 2008 in Jefferson City, Missouri. Maquette is cast in bronze using the lost wax method, mounted on 1 3/4" solid walnut base. Limited edition of 30 signed and numbered; now accepting orders for last remaining Maquette number 30. Portrayed are: York, Lewis, Seaman, Clark and Drouillard. W.17" D.12" H.15" (includes base). Price $3800 plus shipping and handling. Missouri residents add sales tax. Contact the artist to place your order.